Our first installment in this wing is a multi-gallery presentation of Blake’s painting and engraving of Geoffrey Chaucer’s Canterbury pilgrims. The painting, Sir Jeffery Chaucer and the nine and twenty Pilgrims on their journey to Canterbury, is commonly dated 1808 (the date is obscured) and, at 46.7 x 137 cm., is among Blake’s largest works. It was executed in a water-miscible opaque paint of Blake’s invention, which he called “fresco,” and exhibited in Blake’s 1809 exhibition. Blake discusses it for forty-one pages in the exhibition’s Descriptive Catalogue, expressing what Charles Lamb called “a most spirited criticism of Chaucer … mystical and full of Vision.” In October 1810, Blake completed the engraving of the painting, entitled Chaucers Canterbury Pilgrims, which, at 30.7 x 94 cm., is the largest plate he ever executed. The engraving shown here is from the third state out of five states. 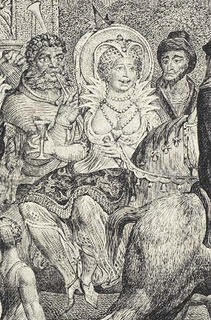 “Chaucers Canterbury Pilgrims”, third state, detail. The first gallery focuses on Blake’s engraving of Chaucer’s pilgrims and contains a general introduction to the circumstances of its creation followed by detailed images and descriptions of the pilgrims, the figures added by Blake, and structures in the design. The captions accompanying these detailed images contain pertinent texts from Blake’s description of Chaucer’s works in his Descriptive Catalogue. The second gallery expands the exhibition’s scope beyond Blake’s engraving to consider the rival design of Chaucer’s pilgrims painted by Blake’s contemporary, Thomas Stothard. 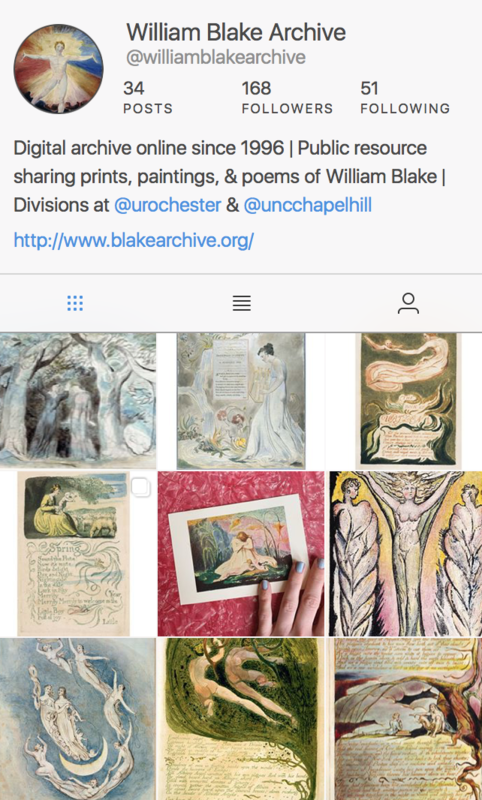 Here again we present a general introduction explaining the controversy involving the two artists as well as Robert Cromek, who commissioned Blake’s designs for Robert Blair’s The Grave and Stothard’s painting and the engraving after it. Blake, Stothard, and Cromek each offered conflicting accounts as to who had the original idea to undertake the subject of Chaucer’s pilgrims. Viewers can then compare eight key pilgrims from Blake’s and Stothard’s engravings, among them the Wife of Bath, the Knight, and the Plowman. The high-resolution detailed images, shown side by side and accompanied by detailed descriptions, allow for close inspection of the minute particulars constituting these designs and vividly showcase the rival styles of Blake and Stothard. 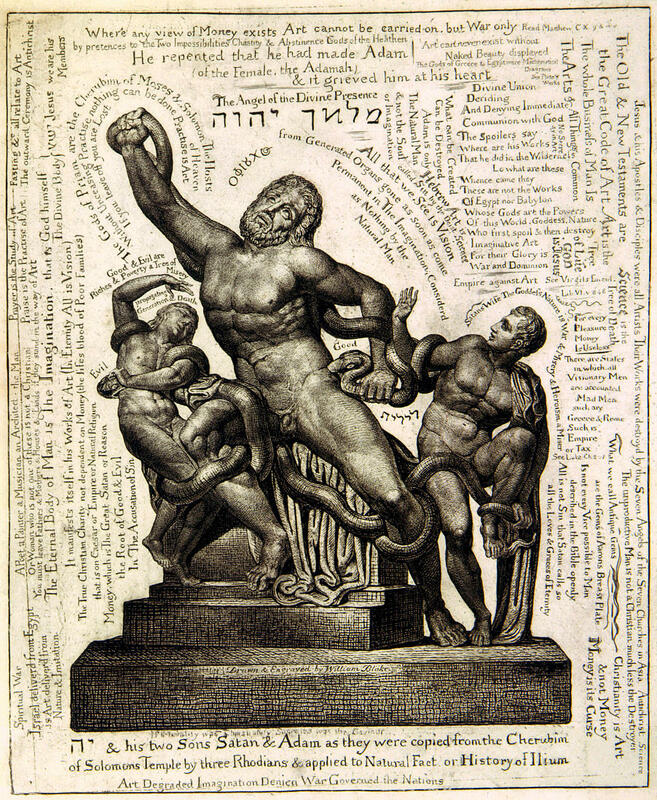 The third gallery presents Blake’s leaflet describing the engraving, which he circulated in 1810, and in which he claims to have “varied the heads and forms of [Chaucer’s] Personages into all Nature’s varieties.” The fourth gallery showcases a selection of contemporary reviews and critical discussions of Blake’s and Stothard’s designs, offering a glimpse of the initial preference for Stothard’s design and an eventual appreciation of Blake’s engraving style, which he claimed was in the tradition of the “old original Engravers,” among whom he included Albrecht Dürer and Lucas van Leyden. Each gallery contains the same navigational features: the introductory text scrolls vertically in the left window, while the main right window—the gallery space—scrolls horizontally through a set of images, each one accompanied by a caption. Users can also navigate using the scrollable set of thumbnails of all the images located below the gallery window. The digital exhibition space has been designed by Michael Fox with the assistance of Tae Lerch of the University of North Carolina’s Office of Arts & Sciences Information Services. The current exhibition, a collaborative project among members of the Archive’s editorial staff, is curated by Joseph Fletcher and Katherine Calvin, with editing, programming, and imaging assistance provided by Michael Fox, Elizabeth Shand, Grant Glass, and the editors.